Best Android Emulators for Windows. Android games and apps are more compact and easy to run. Probably there are multi-millions of applications and games which are available on Google Play Store. On the other hand, PC systems have big screen elements. It increases the level of entertainment, fun, and facilitation. So for combining both qualities, Android emulators are made. Android Emulators are that software who help us to run the Android application and game on PC. There are many Android emulators which are providing their services on multiple platforms. We try to suggest you best in products. 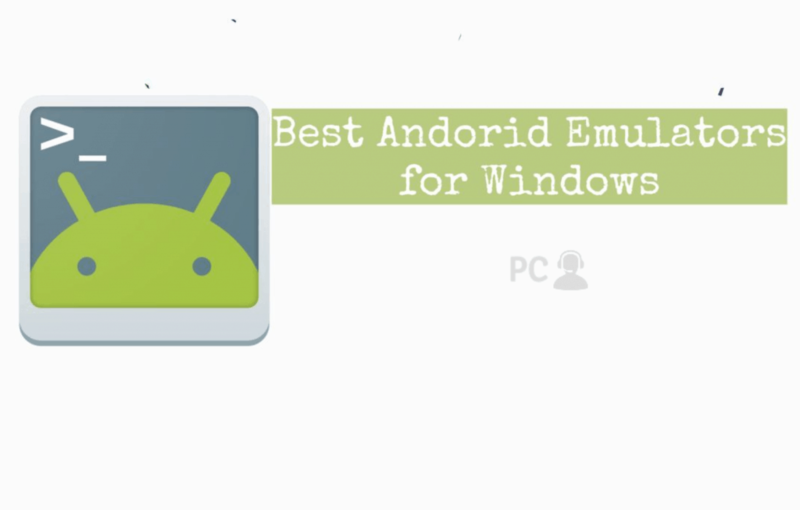 Today we will suggest you the best Android emulators for windows. You can also use this software on Mac OS X. But most of the users love to use Android emulators on windows PC. Android emulators are operated by a proper channel of developers and operators. They properly launch the updates to refine their products more. With the passage of time, emulators are improving their speed, performance, controls and operation skills. Below we have mentioned some astonishing and Best Android emulators for Windows which are the best in their fields. BlueStacks is the trendsetter of this concept. This software introduced the concept of running Android on Windows PC invented in 2009. That was a wonderful thing for the users, who come to know that they can run operating systems just on one device. Probably all the specifications of Android OS are present in stunning software. It was created by the former CTO of Macfree MR Rosen Sharma, Jay Vaishnav, Suman Saraf. Currently, this software us operatable on Windows 7/8/10/Xp/Vista and Mac OS. After BlueStacks, Nox App Player comes second in the list of best Android emulators for Windows. Currently owned by the Big Nox. With the latest version, Nox is many times faster than the previous version. Currently, the Nox is supported by the Android 6.0. Soon it will be updated on the next version. Nox App Player made its reputation by its remarkable services. It offers all the preinstalled and built-in applications present in Android smartphones. Also contains the features like joysticks and arrows to play games on it. MeMu is the creation of famous technology makers and developers Microvirt. It was founded in 2015, and still, they are providing their services of running Android apps on PC. It is ranked as one of the best Android Emulators 2018 by many of the popular technology enthusiasts and platforms like Techadvisor and Lifewire. Till date, it is working fine and the current OS version is Android 5. It is aspected that soon MeMu will get updated on next version. You can run countless Android apps and games on PC through MeMu. Genymotion is the most versatile Android emulator. It offers many Android OS version at a time. It is mainly targeted by developers. Genymotion is also known as Casual Android emulators. It features many specifications which are useful for the application and game developers. Unlike others it’s usage is more on Mac OS than windows. People love to use Genymotion on windows also. That’s why we have included this emulator in the list. Linux users can also experience it on their device. Main Attraction in this software is for gaming lovers because it offers smooth gaming controls. If you love the anime series and their games. Ko Player is the best option for you. This Emulator is rank in best Android emulators list by many technology geeks and innovators. Ko Player run the Android apps and games on PC. So far this software offers a sophisticated and user-friendly interface. Easy to understand for the beginners. It features the exact same controls which we have experienced on Android smartphones. Swiping, tapping, dragging and many others can be controlled through it. Specially designed to convert the game controls on mouse and Keyboard. Andy is not a new addition to the Android emulator’s list. It is the most underrated software in the related field. Although it is good emulator you can’t compare it with the top 2. It is useful for those users who are using low RAM and hard drive on their PC and Laptops. Gaming on Andy is not so good, but for running Android apps on PC, it works brilliantly. You can download it from andyroit.net, or click on the below button. By using You can run the Android tools for PC and Android VPNs for PC.